For your convenience to contact Zappos We have provided all possible information of Zappos. You can contact Zappos on the given phone number +1-(800)-927-7671. To know the address location of Zappos it is also presented here 400 E, Stewart Avenue, Las Vegas, Nevada 89101, United States. Contact them by sending email to Zappos you will find an email address here . To know more about Zappos, go to their website www.zappos.com and collect all possible information from there. You can contact them from their website also. If you have any comment to post or you want to register a complaint against Zappos, you are advised to go to the below box and post your view there. Zappos.com is an online shopping site which provides a large variety of products related to shoes, bags and handbags, baby products, watches, beauty products, clothing, kids’ merchandise, eyewear products, jewelry, sporting goods, swim accessories, home products and other accessories. It is one stop shop for all Age group customers. Additionally this, it also offers gift cards, gift ideas, health and safety products, underwear and intimates, camping equipment, skate and snow gears etc. It is owned by Amazon.com which is a multinational electronic commerce company based in United States. Zappos was established by Nick Swinmurn in the year 1999. It is one of the largest online shoe stores around the world. Since establishment of Zappos, it has sold more than 50,000 varieties of shoes under the brand names Adidas, Camper, Nike, Paul Green, John Varvatos and many more. The headquarters is located in Las Vegas, Nevada, United States. It has adjoined with approximately 1500 employees globally, till 2012. +1-(800)-927-7671 Contact the representatives of Zappos for all types of queries regarding the products, shipping, online shopping, etc. Representative of the Zappos are available twenty four hours all seven days of the week. www.zappos.com Being the online platform, all the services of Zappos are given online. This online market place gives wide range shopping choice to customers under which Zappos sells products related to clothing, beauty, Eyewear, Jewelry, etc. On webpotal of Zappos there is search Box on its home page where you users can type any of products like shoes, bags whatever he is looking for. secure-www.zappos.com/register?checkout=tru On the official website of Zappos customer can create account using this URL, so that customer can take Benefits of various features given by the Zappos. 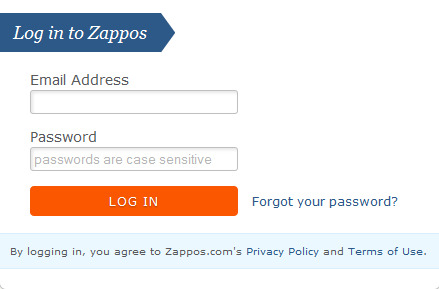 secure-www.zappos.com/login Users can create an account on Zappos and access its log in page through this URL. secure-www.zappos.com/tng/chat.zml Zappos gives option to the users for live chatting so that they can make solve their query without making any call. secure-www.zappos.com/contact Zappos can send their complaints and query directly to Zappos through email id. Customer can send email directly accessing this URL where you need to mention name, phone number, email address, order number, etc. www.zappos.com/general-questions On this page there are list of questions and answers which are usually asked by the users. These questions are usually relates that matter Like payment information, Zappos credit card, product returns, etc. www.zappos.com/self-service-return-instructions Follow this URL to know about return policies of Zappos. Zappos Customer Loyalty Team +1-800)-927-7671 IF you don't have email id then you can call at this to talk to loyalty team of Zappos for all your query. Search in google Zappos with the name Google Plus, Facebook, Twitter, linkidin Pages and you will find more information on these pages. Search in google like Zappos Google Plus Page. When you call to Zappos, ask for toll free number to enjoy charge free calling. At the first step When you call to Zappos please do not forget to tell them that you have found their contact number on findbusinessaddress.com.